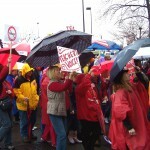 On March 5th, 2011, thousands of Tennessee educators and their supporters met in Nashville to rally against several anti-teacher bills. These thousands stood in the rain all afternoon, sending a clear message. 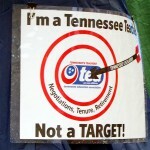 There are multitudes of Tennesseans who are firmly against anti-teacher, anti-education, anti-worker, anti-union bills. We gathered to hear the plan for the day. The, we gathered our signs. 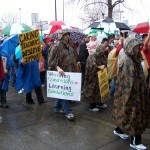 Some had signs on their umbrellas. Some had signs on their ponchos. We lined up, to march to Legislative Plaza. NEA President Dennis Van Roekel was there! We marched to Legislative Plaza. 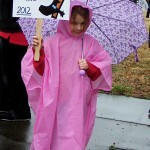 It was a long way to march to Legislative Plaza! Lots of supporters spent the day with us! 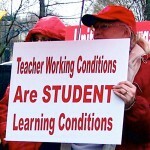 United Campus Workers Support Teachers. 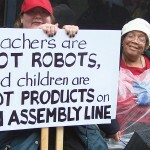 Nashville Peach and Justice Center Supports Teachers. 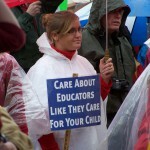 Hamilton County Residents Support Teachers.